We aim to deliver lasting socio‑economic benefit to local communities through programmes aligned with our corporate priorities. We engage and nurture communities wherever we are, with the aim of achieving a sustainable future together. Keppel Care Foundation is the Group’s philanthropic arm. The foundation supports impactful initiatives that are in line with the focus areas of protecting the environment, promoting education, arts and culture as well as caring for the underprivileged. Employee volunteerism complements and enriches our community investments. Keppel Volunteers, the Group’s volunteer movement, spearheads regular volunteer activities. In 2016, employees across the Group achieved over 8,000 hours of community service, an increase of 3,000 hours over the 5,000 hours in 2015. Keppel Volunteers planted trees at Keppel Discovery Wetlands to signify the Group’s commitment to environmental conservation. Keppel is committed to uplift communities wherever we operate. In 2016, the Group formalised overseas chapters of Keppel Volunteers in Brazil, China, the Philippines and Vietnam. In Brazil, BrasFELS engineers lead Teach‑It‑Forward, a programme to benefit public school children and youth in Angra dos Reis. Classes are conducted for students in need. In China, Keppel organised numerous charity fundraisers in aid of underprivileged children and youth in the community. Keppel’s community engagement initiatives in the Philippines include the College Scholarship programme and Apprenticeship and Technical Skills Training programme to help students with financial difficulties and empower them with skillsets. Acknowledging Keppel’s efforts, the Philippines Economic Zone Authority conferred Keppel Subic Shipyard with the Outstanding Community Projects Award in 2016. In Vietnam, Keppel supports Words on Wheels, a mobile library programme to promote reading and independent learning among 3,000 children in the rural outskirts of Ho Chi Minh City. Keppel has provided many platforms to showcase artistic talents and expose youths to the arts over the years. In recognition of the Group’s contributions, Singapore’s National Arts Council presented Keppel with its ninth consecutive Distinguished Patron of the Arts Award in 2016. 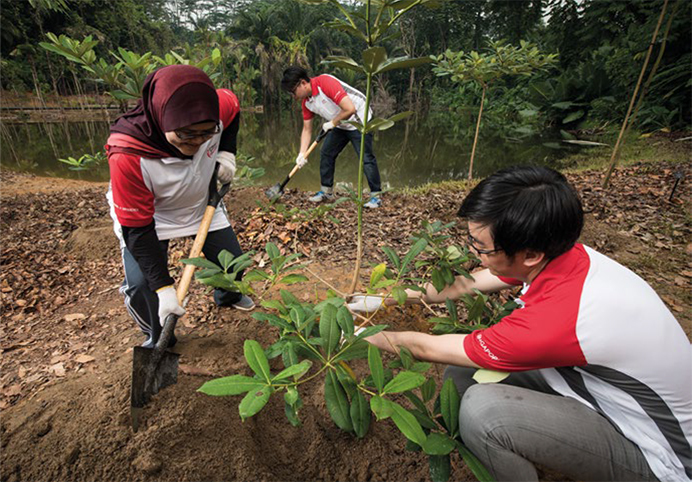 The Keppel Centre for Art Education at the National Gallery Singapore is the Keppel Volunteers planted trees at Keppel Discovery Wetlands to signify the Group’s commitment to environmental conservation. region’s first art education facility of its kind in the region. Established with a $12 million commitment from Keppel, the Centre has benefitted over 300,000 participants in 2016. Guided school tours and workshops introduce visual literacy, analytical and interpretive skills to students and support Singapore’s national curriculum. Keppel Nights, developed in partnership with Esplanade – Theatres on the Bay, provides students from heartland schools with access to world class performances and exposure to various art and cultural forms. Since its relaunch in November 2013, the programme has benefitted close to 20,000 students from 72 schools. Keppel committed $2.08 million to the establishment of Keppel Discovery Wetlands, a freshwater forest wetland ecosystem historically found in the vicinity of the Singapore Botanic Gardens. The restored 1.8 hectare forest wetlands, which is scheduled to open in 2017, will enhance the biodiversity in the area and provide opportunities for the public to experience and learn about the freshwater forest wetland habitat in the heart of the city.